In the action world, one of the least expensive things to do, though not necessarily the easiest, is to create a fight piece. You need some stunt players, some pads, maybe some rigging. That’s it. Anything more adds production value but most viewers aren’t noticing the finer production design details when somebody is being kicked in the face! Remember that fight in The Bourne Ultimatum? It was a hybrid of Krav Maga and Kali styles of fighting. But what was Jason Bourne’s “weapon”? A book. 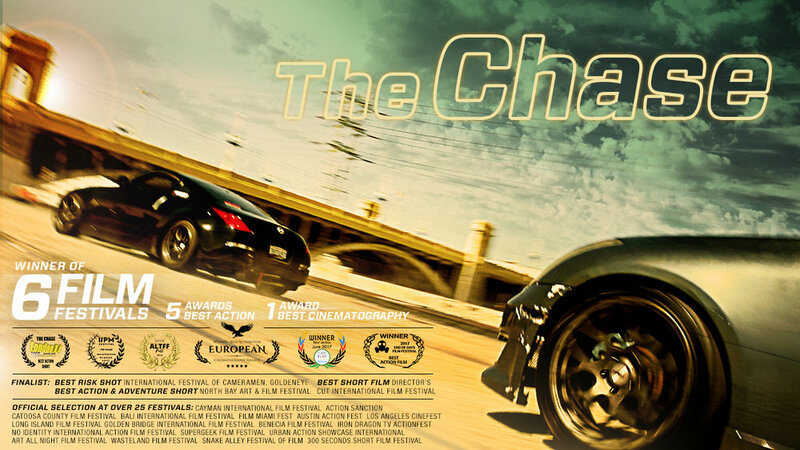 As a fan and director of action sequences, I wanted to challenge myself and decided to create a car chase. Not easy, and definitely not cheap. And the risk factor comes much more into play. The dynamics of car chases have changed in the last few years—cars are coming out of planes, flying off buildings into other buildings, or even driving in corn fields. There are no roads in this type of “car chase,” and we’re seeing more of them. In some cases, legal and insurance reasons are dictating chases set in rural locales or created in CGI. And sometimes a car chase sequence has a little magic, like the opening sequence of Drive or the motorcycle chase at the end of Girl with the Dragon Tattoo. Both are short, sweet and tastefully done, and serve the story. The music, sound design, color all come into play to create something unique. Moreover, there are elements that really stand out within certain sequences. For example, Frankenheimer had more than 200 rally drivers for Ronin. And Mad Max’s masterpiece would not have been made if not for the camera car driver, the unsung hero. The chase was linear for the most part, yet it was a roller coaster of adrenaline. Herein lies my own contribution to the body or work—The Chase. I studied the masters. I blended an undercurrent of narrative with techniques from Vic Armstrong (stunt legend), Dan Bradley (second unit director of the Bourne films/Quantum of Solace), Spiro Razatos (second unit director of Fast and Furious films). I also wanted to pay tribute to the original car chases: Bullitt and Rendezvous. I looked at Tony Scott’s BMW film The Devil for stylistic inspiration. Further, I was influenced by Sergio Leone’s For A Few Dollars More. As Leone replaced swords with pistols, taking from Kurosawa’s Yojimbo, I saw the car chase as exchanging pistols for cars. As in Leone’s film, the duel was re-upping each other’s skills. This was a duel in a different form. So I started with the idea of a car chase. Through weeks of location scouting for the right environment, the chase started to form in my head. Once I decided on the locations, I returned to them half a dozen times until I could see the car chase vividly in my mind. It’s about creating energy in the shots, and production design is key. Here’s why: Camera movement, cars moving through an urban landscape, give you much more dynamic footage than shooting off a process trailer. The idea is that you are trying to create the illusion of speed. This is why filming something in the desert or in the middle of nowhere does not give an illusion of speed. It’s the lights, trees, buildings, etc. in the background that simulate the feeling of speed, not always the cars themselves. Where you shoot will determine how fast the sequence feels. This will also determine the edit, as that is the next bottleneck. For example, if there is no simulation of speed in the landscape, then you see extremely fast cuts four to eight frames long to give the illusion of speed. This is the difference of shooting for speed versus editing for speed. And of course, once you get into crashes or explosions, the dynamics and costs change dramatically. It can help tremendously to demonstrate the different scenarios using chalk lines on the ground. Especially if you are at the location, you can demonstrate in the actual environment. Some chalk and a few toy cars will cost you less than $25—a worthwhile expense. Tip: If you haven’t worked with your stunt and camera car drivers before, it’s always good to have them do the choreography with the toy cars, after you demonstrate it to them. That way, you see that they can execute. There’s no room for error once you are out there! This was an indie project through and through, but we worked hard to achieve Hollywood production value. The post team was dedicated to giving our chase sequence its final form, from color (Company 3) to sound (Formosa Group) with an assist from Rick Pearson, editor of The Bourne Supremacy. Using the footage we had and my original vision, we developed the beats and geography to make the sequence what it is. Putting together a car chase has been my lifelong dream ever since the first time I saw Bullitt. Now that I know the ingredients, I can’t wait to re-tool the recipe on the next one.